This portable electroencephalograph headset is extra lightweight because it is battery-free. 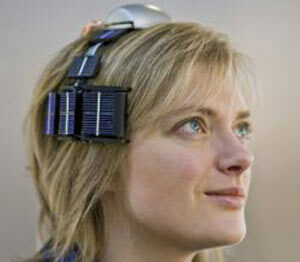 Researchers at the Interuniversity Microelectronics Centre (IMEC), in Belgium, created the headset. Lots of uses in health care, of course. Wireless monitoring of patients would be easier in hospitals; people with a risk of seizure could keep the device on all the time, with a warning if particular patterns are seen. The researchers also can see this device being used as a game interface, providing head case users with a new way to relate to their machines. After that they'd throw the cephscope, damaged beyond repair, and Jerry Fabin, damaged beyond repair, into the same ash can. Best of all, the EEG headset powers itself from the temperature difference between your head and the rest of the world - yes, that's right, it's a parasitic power harvesting device. Via Brainwave-reading headphones need no batteries.